Do you often find your bananas looking like this before you can get to eating them? I definitely do. The old trick is just to throw the bananas in the freezer to use for baking at a later date. I’ve added a small but helpful spin to this old trick by slicing the bananas prior to putting them in the freezer. 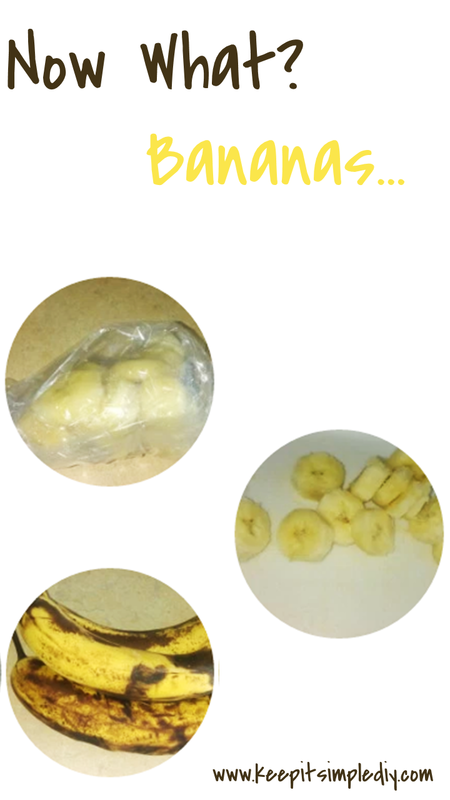 More specifically, I use one sandwich bag per banana to help manage quantities for recipes and avoid having multiple a big frozen banana ball. Not only does this make storing the bananas more compact, it also alleviates the need to try to un-peel an overly ripe frozen banana. Bananas have so many uses from ice cream to baked goods. Here are my three favorite ways to use the overly ripe bananas. 1. Pancakes – I thaw and mash the banana in my mixing bowl then in the same bowl add the all of the standard pancake ingredients. Once mixed, I’ll add a bit of syrup to the batter then bake in muffin tins. This allows the pancakes to stay moist and even be used as breakfast on the go. 2. Smoothies – This is where the slices really come in handy. Rather than grabbing a handful of ice cubes or a couple scoops of ice cream, I just grab a baggy of banana and add to the mixer then fill with my favorite ingredients. It makes me feel a like I’m drinking something healthy even if my smoothie is loaded with chocolate syrup. 3. Banana Bread – Yes, the old favorite. Banana bread. For me, I end up with so many bananas throughout the year that I just can’t stomach that much banana bread. On the off chance that I have so many bananas that I can’t find anything else to do with, I will make banana bread, but with a twist. Last year, I made some coconut (coconut milk) pineapple (extract) banana bread in the summer and just recently, I added cocoa powder and chocolate chips to my recipe to make a delicious chocolate banana bread. I made a double recipe because I had that many bananas available and realized that I didn’t have two bread pans. So, I used the taco bowl tortilla pans that I have and it worked out great! I think I need to try the pancakes and bread out! I am always throwing out bananas. Great idea with freezing them cut up. I’m a huge banana fan, but find them getting a little spoiled before I can eat them all! These are perfect ideas. Thank you! I always forget to freeze my over ripe bananas! Good tip to peel them first before freezing. I love banana pancakes and banana bread! Yes! I just started freezing bananas. The one sliced banana per bag is a great idea. Great suggestion! My husband loves freezing bananas for banana bread but he never slices them before freezing them. I am going to share this post with him. Thanks for sharing. I make a lot of muffins, or I put the banana (with no peel) in a ziplock and freeze for the next muffin session. Hi! I actually already posted on the party. I’m the one with the pink and green diamond wall picture. I was featured on your linkup partners’ page this week with my couponing post. Thanks for the support! Ha ha aren’t you more on the ball than me! I totally remember the coupon post now you say that and saw the featured button on your blog as got all excited to see it! Congrats and good job. Keep up the awesome posts!